If you want to get the most bang for your million bucks then taking in all Seven Natural Wonders of the World is a good way to go. 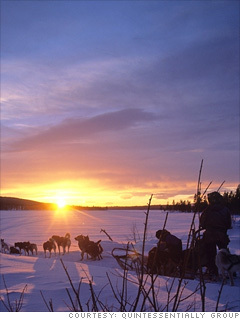 For starters, climb aboard a private jet heading to the Arctic North of Sweden, then travel by helicopter, and then dog sled (pictured) to a private ice-palace to see the Aurora Borealis, also known as the Northern Lights. From there it's off to Zambia in Africa for a private helicopter tour of Victoria Falls, the largest waterfall in the world. Rest in a private colonial estate and take in an African safari on horseback while you're there. Then it's back on the jet destined for Nepal, where a helicopter is waiting to offer a bird's eye view of Mount Everest, the tallest mountain in the world. Catch your breath over lunch with Buddhist monks at the Tengboche Monastery before flying on to Australia, where you can snorkel or deep sea dive along the Great Barrier Reef. Before heading back to American soil to cruise the Grand Canyon, a few optional stops include Fiji and Bora Bora in French Polynesia. Then it's down to Mexico, to see the remote Paricutin Volcano by horse-back. Your final stop is Brazil's infamous Rio de Janeiro. Circle the famed Christ the Redeemer statue by helicopter with fireworks celebrating your arrival, then collapse on a private island in Agua Dos Reis.